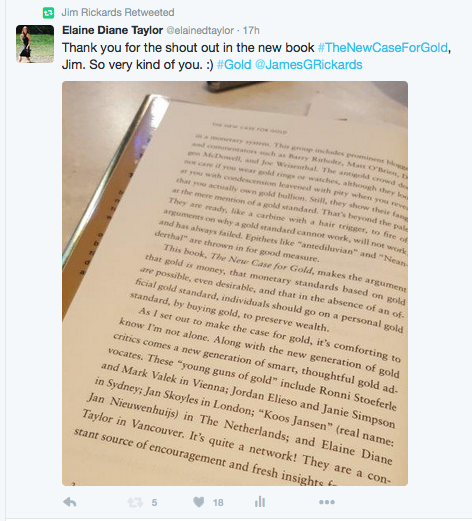 A synopsis of an interview with Jim Rickards, New York Times bestselling author of The New Case for Gold, The Death of Money, Currency Wars and The Road to Ruin, by CNBC. Jim is the editor of Strategic Intelligence, former general counsel for Long Term Capital Management, and a consultant to the U.S. Intelligence community and U.S. Department of Defense. An oil embargo will not be effective. North Korea has already beaten the world to the punch. They’ve been building up their strategic oil reserves and have almost a year’s worth of oil held in reserve. Also, China has cheated a lot on sanctions in the past. The thing that would be effective would be for the US to exclude the Bank of China, ICBC and some of the Chinese banks from the US dollar payment system, and shut down their US operations. They’re facilitating North Korean finance, and that would be a kind of sanction that would actually bite. But China wouldn’t necessarily put pressure on North Korea if the US did that. They could just put other sanctions on the US, and you would have an escalating trade and financial war between China and the United States without solving the problem with North Korea. North Korea is in a state called “break out”. Usually when countries are cheating on nuclear proliferation and development programs, such as Iran, they do it in baby steps. They get called out, so they back off and wait a year or two, then they break their promises and resume. North Korea has put all that aside and they’re in break out. Kim is going for it and not hiding anything. He’s hoping that the US is bluffing, and that North Korea will be able to get a serviceable ICBM with a hydrogen bomb that can destroy Los Angeles before the US does anything. The US has maybe six months to act. And the US will act. China would look after their own interest. They would be concerned about a US ground invasion if the US got anywhere near the Yalu River, as we saw in 1951. (The Yalu River divides North Korea and China). They would also be concerned that the US was trying to reunify the Korean Peninsula on US terms. The way the US would deal with China would be to say that the US will act strategically — they will use tactical means to destroy the regime but will not get anywhere near the Yalu River. The US will have special operations. They’ll use cyber operations. The first thing that will happen is that the place will go dark. The US will shut down the North Korean power grid and shut down the Command and Control. They’ll use cyber operations and psychological operations before the heavy bombers will go in, making North Korea unable to even order their artillery to fire. But, of course, North Korea will fire. That’s close to the DMZ (the strip of land that is a demilitarized zone between North and South Korea that divides the Korean peninsula). The US will tell China that after it has removed the North Korean regime it will talk to China about reunifying the Korean peninsula on mutually beneficial terms. That will be good enough for China. Arrived in Ottawa. Beautiful city. Time for sleep. Gold is $1,337.20 U.S. per ounce today. This pendant has 2 grams of nugget and flake raw pure gold. Straight from the wild rivers along the Gold Rush Trail in British Columbia, Canada. Unrefined. Encased in boro silicate glass. Hand torched in my studio. Available soon. 2017 Elaine Art & Media. All rights reserved. The news comes down, a little blue bird sings, words of war, of fire and furious things. President Trump has announced to North Korea that it will defend the US and its allies. North Korea has continued to work towards creating the technology to hit the continental US with nuclear weapons. It’s a terrible breeze they speak of. We all know wind can blow both ways. Defense sometimes involves offense. It’s a horrible balancing act that we all wish didn’t need to be performed in a storm. Intelligentsia Media Inc. All rights reserved. 2013 Intelligentsia Media Inc. All rights reserved.